[S185] Property Titles. ; PROV (Public Records Office Victoria), C/T 1569-671 - The Second Universal Terminating Building Society of No 6 Collins Street Melbourne. [S185] Property Titles. ; PROV (Public Records Office Victoria), C/T 1889-604 - Mary Ann Hollow the wife of Joseph Hollow of Burnley Street Richmond Builder and Contractor - to Kate South of The Vicarage Rochester Married Woman. 25 Apr 1906, A boy named Mason, about 12 years of age, residing with his parents at the old Inebriate Asylum, in the Beaconsfield Ranges, was lost in the bush on Saturday afternoon. The lad, who is not of strong intellect, left home about 11 o'clock, driving the cows out to pasture. He called at Cosgrove's old place about noon, and when asked to stay for dinner refused. The woman in charge of the place went to cut him some bread and butter, but when she returned with it he was not to be seen, nor had he been heard of since. Diligent search in all the neighboring gullies has been made by residents of Beaconsfield and Berwick, and on Sunday the blacktrackers arrived from Dandenong. Owing to the heavy rains the previous night the trackers were un able to pick up any tracks. and up to 7 o'clock that evening no tidings had come to hand. The unfortunate boy had no coat or hat, so he probably fared badly in the inclement weather last night. Constable Steele and the blacktrackers were out again all day Tuesday, but did not succeed in finding him, though they came across traces where he had sat down by the side of a track to get a drink some time since the heavy rain of Saturday night, but how recently the trackers could not say. 26 Apr 1906, A SAD FATAL ACCIDENT. Melbourne, Thursday. 2 May 1906, LOST BOY AT BERWICK. CRYING HEARD IN THE DARK. BERWICK, Tuesday. — Information reached Mounted-constable Steele last evening that a rabbit-trapper named Ernest Warmbrunn, who is trapping along the Cardinia Creek between Berwick and Beaconsfield, had heard cries when returning from visiting his traps on the Saturday night on which the boy wa lost. The trapper heard cries which he described as "unearthly" in sound. The place where they were heard was a mile distant from where the missing boy Mason was last seen. The boy could not speak distinctly, so that his cries would be indistinct, and what the trapper calls "unearthy." The locality was searched by the small party out from about 11 a.m.until nearly nightfall, but with no success. The search will be resumed to-morrow. Should it again be unsuccessful, it proposed to organise another large search party for Sunday next. 5 May 1906, A SADLY BEREAVED FAMILY. BOY LOST IN THE BUSH. GIRL KILLED DURING THE SEARCH. BERWICK, 25th April. No trace has yet been found of the missing boy Mason, who was lost in the bush at Upper Beaconsfield on Saturday last. Two black trackers, Charlie and Peter, arrived from Dandenong on Sunday in charge of Constable Fawlkner, but owing to the heavy rains on Saturday night having quite obliterated all tracks and the dense thickness of the ti-tree and other scrub, the task of finding the boy is a difficult one, as it is quite possible to pass within a few yards of him without finding him. There are a number of abandoned mining shafts in the locality. A dreadful accident happened in connection with the search, Miss Aggie Mason, 17 years of age, one of the sisters of the missing boy who had come from the city to help in the search, was mounted on a trooper's horse, and, accompanied by her blind brother, was to come to Berwick to send some telegrams. The horses bolted, and Tracker Charlie, who accompanied her, galloped to the girl's assistance. He had succeeded in getting hold of the bridle, and dropping his own bridle, he was reaching to secure Miss Mason, when the horses jumped a drain, and the young lady became unseated and fell, fracturing her skull. Dr. Bennie was hastily summoned, but she never rallied, and died last night. Widespread sympathy is felt for the family in their trouble. The whole neighborhood is to be searched again for the missing boy, but small hope is entertained of finding him alive. 7 May 1906, ALL HOPE ABANDONED. Melbourne, Monday. 7 May 1906, LOST BOY AT BERWICK. SEARCH NOW ABANDONED. BERWICK. Sunday.—On Saturday, April 21, during the forenoon, a boy named Mason, 15 years of age, wandered away from his home the Old Female Inebriate Asylum, in the Beaconsfield Ranges. He was traced the same day to the residence of Mr. Luke, better known as Cosgrove's, about three-quarters of a mile away, where he was last seen about half-past 12. He left there, and then all traces of him disappeared. the relatives at once communicated with the police, and Mounted-constable Falkner, of Dandenong, with the black trackers Charlie and Peter, arrived on the scene on Sunday, April 22. Since then search parties have been seeking traces of the boy in all directions, but without result. A sad fatality occured on Tuesday April 24, when Miss Mason, aged 17 years, a sister of the lost boy, was thrown from her horse while assisting in the search, sustaining injuries from which she died in the following morning. On Sunday April 29, a large seaarch party of over a hundred persons scoured the hills, gullies, and this unsuccessfully. All that they found was the boy's cap, which was of no importance as a clue, for when last seen he was without it. Since then parties have been out daily. The police decided on organising another large search party for to-day, to make a final effort to find the remains. There has been several showers of rain during the night, but the morning broke bright and fine, and by 10 o'clock a large number of volunteers had assembled at the rendeavous. Constable Falkner subdivided the party, and the various sections proceeded at once to work, traversing the hills and gullies to the south of Cosgrove's. One party proceeded along the tracks on the tops of the hills in the direction of Upper Beaconsfield and Officer. Another section swept the flats and gullies towards Lower Beaconsfield, while a large party of horsemen proceeded up the Cardinia Creek for some miles. Then, leaving their horses in charge of two or three, the others proceeded down the creek, thoroughly searching it on both sides. All the parties met at 1 o'clock to report progress except a few who proceeded along the tracks leading to Pakenham and Gembrook, on the tops of the hills. These did not return until 4 o'clock. After lunch the whole party thoroughly searched the paddocks and reaches of the creek adjacent to the spot where the cries were heard on the night the boy was lost; but all efforts were unsuccessful, and about 5 o'clock the party reluctantly gave up the search, returning to their homes. Fully 150 persons took part to-day. Every praise must be given to Constables Steele and Falkner and to the large num ber of volunteers who turned out to search day after day. The search will now be abandoned. gives birthdate as 8 Sep 1886 and name as John Ignatius. [S16] Newspaper - The Age 28 Apr 1906, p5. [S11] Newspaper - Argus 23 Apr 1906, p8. [S12] Newspaper - South Bourke and Mornington Journal 25 Apr 1906, p3. [S14] Newspaper - The West Australian, 26 Apr 1906, p6. [S11] Newspaper - Argus 26 Apr 1906, p4. [S14] Newspaper - Barrier Miner (Broken Hill, NSW), 26 Apr 1906, p2. [S11] Newspaper - Argus 2 May 1906, p7. [S14] Newspaper - Leader, 5 May 1906, p23. [S14] Newspaper - Barrier Miner (Broken Hill, NSW), 7 May 1906, p2. [S11] Newspaper - Argus 7 May 1905, p5. [S14] Newspaper - The Mercury (Hobart), 10 May 1906, p3. [S14] Newspaper - The Australasian (Melbourne, Vic. : 1864 - 1946), Sat 12 May 1906, p28. 9 Apr 1890, NEW SOUTH WALES. Sydney. April 8. [S80] Ancestry - Family Tree, scott (hayhay84) - Owner: hayhay84. [S7] Registry of NSW Births Deaths and Marriages "#M1727." [S14] Newspaper - Sydney Morning Herald, 9 Apr 1890, p1. [S14] Newspaper - Sydney Morning Herald, 9 Apr 1890, p5. [S14] Newspaper - South Australian Register (Adelaide), 9 Apr 1890, p5. [S14] Newspaper - Border Watch (Mount Gambier, SA), 16 Apr 1890, p2. 27 Apr 1906, THE LOST BOY. 28 Apr 1906, THE MASON FAMILY. TO THE EDITOR OF THE ARGUS. Sir,—Your numerous readers have all the sad particulars of the misfortune that have befallen the Mason family at Beaconsfield—the boy, aged 15, being lost in the bush on Saturday last; the daughter, aged 17, being killed by a fall from her horse on Tuesday—in addition to the above, the family are in very destitute circumstances, having barely sufficient to procure the necessities of life. Constable Steele is organising a local subscription list, to enable sympathisers to show some practical help. Might I enlist your sympathy towards this movement, as the case is one deserving of help? Constable Steele and myself will be pleased to receive Subscriptions.—Yours, &c.
Sir, Mounted Constable Steele and myself interviewed Mrs Mason to-day. She states that her son has seen several doctors about his sight, and the only one who held out any hopes of his recovering it was Dr. Woods of Albury, who saw the boy 14 years ago, and said he "might," when reaching the age of 21, find it improving. He is a little over that age now, and his mother is willing that anything we think is best should be done. We think that, as certain gentlemen have given donations for that purpose, the boy should see a couple of specialists to learn is there is any hope for him. Could that not be done in the Eye and Ear Hospital, as, beyond the subscriptions in your hands, there are no means available. We would take any steps suggested, and should be pleased to receive communications from those who have kindly interested themselves. I am, &c.
Sir, The day after my previous letter in re the blind boy Mason appeared in your columns I received a kind reply from Mr A S Gray, senior surgeon to the Eye and Ear Hospital, asking me to take the boy to him for examination, when, if necessary, he would be received as an in-patient to undergo operation. This was done on Saturday, the 19th inst., and he was seen privately by Mr Gray and Mr Rudall. He attended at the hospital and was examined by the staff. The result was an opinion that operation would be of no avail, but that constitutional treatment "might" do some little good. The money, therefore, sent to you to enable an operation to be performed might, with the donor's consent, be devoted to paying the travelling expenses of his attendant, once a fortnight, to and from the hospital—the boy himself having a free pass—any surplus being added to the fund, which i may add, we purpose closing at the end of this month. Thanking you for your valuable co-operation. Yours, &c.
Sir. As trustees of the fund subscribed by the public for the Mason family, which has now been closed, we desire to inform the subscribers how the money has been dealth with. The amount collected locally was £29/8/6, "The Argus" list £18/10 , making a total of £47/18/6. We consulted Mr Mason and her blind son as to the disposal of this money, and they authorised us to pay a few local accounts, amounting to £7/4, the balance, £40/14/6, to be placed in the Savings Bank as a trust account, in our joint names for the benefit of the blind lad, who will be able to operate on it as occasion may demand. We desire to thank the public for their sympathetic help, Dr A S Gray for his kindness and gratuitous treatment of the case; and yourself for the valuable ... operation of "The Argus". Yours &c.
11 Apr 1911, CASUALTIES AND FATALITIES. -o- THROWN FROM VEHICLES. Mrs. Anna Mason, residing near Berwick, yesterday drove to the railway station, with Mrs Agnes Weldon, of St. Andrew street, Middle Brighton, who had been visiting her, and who intended to return to Melbourne by the midday train. 1 Sep 1915, The second case was Mrs A Mason of Narre Warren, who lost her son and while her daughter was taking a telegram to the post office she was thrown from her house and killed. Her remaining son is blind. Mrs Mason lives on a recently-selected Crown Allotment and is practically destitute. Steps are being taken locally to render assistance but a good deal of help is needed and should any of your numerous readers be able to render assistance, will they communicate with us at the Shire Hall? [S22] Victorian Government. BDM Index Victoria (online) "place of birth in death reg - no listing found." [S22] Victorian Government. BDM Index Victoria (online) "father as George MELBOURNE." [S11] Newspaper - Argus 29 Oct 1943, p2. 4-552-B Welbourne [Catherine] F 83 29/08/1914 527 (mother). [S11] Newspaper - Argus 27 Apr 1906, p6. [S11] Newspaper - Argus 28 Apr 1906, p17. [S11] Newspaper - Argus 15 May 1906, p5. [S11] Newspaper - Argus 29 May 1906, p7. [S11] Newspaper - Argus 19 Jun 1906, p6. [S11] Newspaper - Argus 11 Apr 1911, p4. [S11] Newspaper - Argus 1 Sep 1915, p7. 26 Apr 1906, SEARCH FOR LOST BOY. SISTER DIES FROM INJURIES. [S7] Registry of NSW Births Deaths and Marriages "#B10465." Female, Mason, Agnes Mary Agatha, Fracture of the skull haemorrhage on the brain caused by fall from horse, Beaconsfield, 1906/506, 25 Apr 1906,. Death-Notice* 12 Mar 1954 MASON.—On March 11, at 42 Wellington Street, Collingwood, Joseph George Mason, beloved husband of Joyce and loving father of Mick, Irene, Heather, Julia, John, Gladys, Robert, June and Richard. Late of Narre Warren East and Hallam. Requiescat in pace. [S1] Registry of Births Deaths and Marriages Pioneer Index Victoria 1836-1888 "#D11406." [S16] Newspaper - The Age 12 Mar 1954, p12. [S11] Newspaper - Argus 17 Apr 1919, p8. [S11] Newspaper - Argus 13 Feb 1939, p2. [S1] Registry of Births Deaths and Marriages Pioneer Index Victoria 1836-1888 "#B17589." [S80] Ancestry - Family Tree, Moss Family Tree Owner: Helios_Doyle. Death-Notice* 22 Nov 1897 MASON -The Friends of the late Miss FLORENCE ELIZABETH MASON are respectfully invited to follow her remains to the place of interment, Melbourne General Cemetery. The funeral will leave the residence of her aunt, Mrs Bowes, 20 Drummond street, Carlton this day (Monday, 22nd inst. ), at 4 o'clock. [S1] Registry of Births Deaths and Marriages Pioneer Index Victoria 1836-1888 "#B23728." [S11] Newspaper - Argus 22 Nov 1897, p1. [S11] Newspaper - Argus 24 Nov 1897, p1. 24 Jan 1922, HOLIDAY RESORTS. Beaconsfield Upper. [S2] Registry of Births Deaths and Marriages Federation Index Victoria 1889-1901 "#B13089." [S4] Registry of Births Deaths and Marriages Great War Index Victoria 1914-1920 "#M1914." gives name as Norma BLANCHARD, married at Hawthorn Presbyterian Church. [S185] Property Titles. ; PROV (Public Records Office Victoria), C/T 1105-923 - Frederick Duncan Love of Upper Beaconsfield Orchardist. [S185] Property Titles. ; PROV (Public Records Office Victoria), C/T 3484-651 - Frederick Duncan Love of Upper Beaconsfield Orchardist. [S185] Property Titles. ; PROV (Public Records Office Victoria), C/T 3484-651 - Mortgage No 450410 to Thomas Eales. Discharged 19 Sep 1929. [S185] Property Titles. ; PROV (Public Records Office Victoria), C/T 1105-923 - Mortgage No 549273 to Charlotte Maria Marshall. Discharged 14 Feb 1934. [S185] Property Titles. ; PROV (Public Records Office Victoria), C/T 3484-651 - Mortgage No 549273 to Charlotte Maria Marshall. Discharged 19 Sep 1929. [S185] Property Titles. ; PROV (Public Records Office Victoria), C/T 3484-651 - Rosamond Pridham Love of 101 Alma Road East St Kilda Married Woman. [S185] Property Titles. ; PROV (Public Records Office Victoria), C/T 1105-923 - Worthy Carpenter of 1B Ballarat Road Footscray Wool Sorter. [S101] Electoral Roll for Australia, 1903 - 1980 "together on electoral rolls to 1931." [S19] Newspaper - Berwick Shire News and Pakenham and Cranbourne Gazette "28 Jan 1914, p2." [S11] Newspaper - Argus 24 Jan 1922, p10. 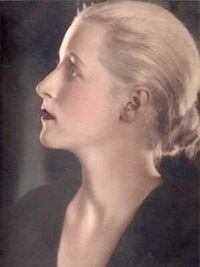 Death-Notice* 31 May 1949 LOVE.—On May 30 (suddenly), Rosamond, loved mother of Lorraine (deceased) and Rosamond (Mrs. G. Eastwood), and loved grandmother of Rosamond, Peter, and Clive. LOVE.—On May 30 (suddenly), Rosamond, loved sister of Dorothy (Mrs. O. Hammerstein, U.S.A.), Dubbie (Mrs. H. G. Schnabl), Doodle (Mrs. J. Watanabe), and Marjorie (Mrs. Roy Youlden). 4 Sep 1915, BANK NOTES MYSTERY. WOMAN CLAIMS OWNERSHIP. The police authorities believe that the mystery concerning the reported finding, in July last, of a "roll of bank notes" by a girl, who is said to have handed them to a constable on duty in Collins street, has been cleared up, inasmuch as Mrs Love, of Beaconsfield, now staying in Williamstown, called on Inspector Keegan yesterday, and reported the loss of four £1-notes on July 12, in Collins street. Mrs Love said that on that day she cashed a cheque for £6 at a bank, and spent £2, the last £1 at Georges'. In company with her sister, she walked down Collins street, past the "Age" office, to the Mia Mia tearooms. While in the tearooms Mrs Love missed the four £1-notes and concluded that she had been robbed in the crowd in front of the newspaper office. On the advice of her brother-in-law, Mrs. Love advertised her loss in an evening paper. 30 May 1946, Mrs Oscar Hammerstein Back After 16 Years After an absence of 16 years Mrs Oscar Hammerstein II returned to Melbourne last night with her husband, the famous song writer, on a three weeks' visit. Mrs Hammerstein was formerly Miss Dorothy Blanchard, of Melbourne. M Hammerstein is her second husband, and she is his second wife. When she went to America she appeared in revue, and understudied Beatrice Lillie, who later became godmother to Mrs Hammerstein's daughter Susan. Nine years ago Mrs Hammerstein opened an interior decorating studio in New York, and this, she says, has become almost a full-time job. "I'm crazy for colour," she said, "and I think that people should have gay surroundings. Young people should not live in an atmosphere which looks as if it belonged, to their grandmothers." Mrs Hammerstein describes the Hammerstein family as "yours, mine, and ours." Her 18-year-old daughter Susan is now in films, being groomed for stardom by 20th Century Fox, with whom she has a- seven-year contract. A son by her first marriage is at school in Pennsylvania, and Jimmy, son of Mr and Mrs Hammer stein, is also at school. Yesterday Mrs Blanchard, Mrs Hammerstein's 80-year-old mother, was anxiously waiting for her arrival. She was particularly thrilled by a present which her daughter brought from New York-two pairs of nylon stockings. [S185] Property Titles. ; PROV (Public Records Office Victoria), C/T 3484-651 - Worthy Carpenter of 1B Ballarat Road Footscray Wool Sorter. [S5] Registry of Births Deaths and Marriages Death Index Victoria 1921-1985 "#D5584 (Age 56) [par Henry Charles BLANCHARD & Marion PARMENTIER]." [S11] Newspaper - Argus 31 May 1949, p9. [S29] Nominal Roll, Australian War Memorial - WWI, Punch (Melbourne), 8 Apr 1915, p24. [S11] Newspaper - Argus 4 Sep 1915, p18. [S11] Newspaper - Argus 26 Oct 1929, p13. [S11] Newspaper - Argus 30 May 1946, p10. [S11] Newspaper - Argus 27 Jun 1946, p8.